KIEV, Ukraine (AP) — Mohamed Salah came to Kiev with dreams of Champions League and World Cup glory. He left with his arm in a sling, his Liverpool team defeated and his World Cup in jeopardy. The Egyptian was hurt when he tangled with Real Madrid captain Sergio Ramos and had to go off in the 30th minute. 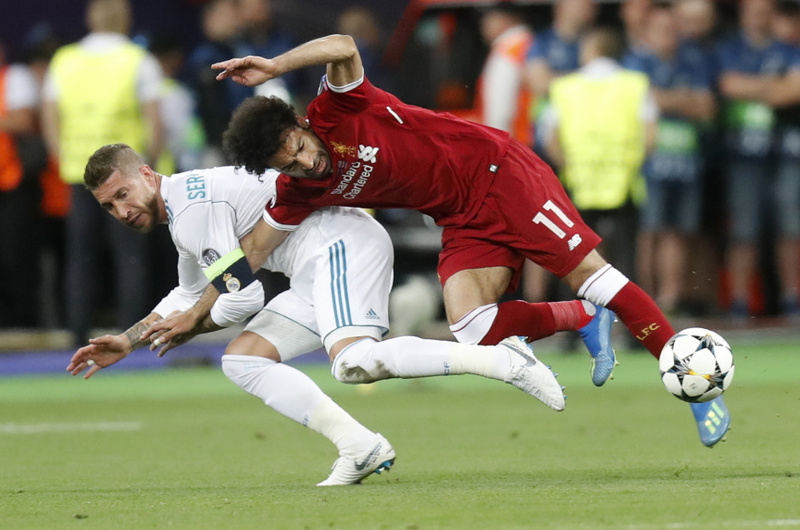 Veteran defender Ramos grabbed Salah chasing the ball and held on to his right arm. In their twisting fall, Salah landed heavily on his left shoulder. Ramos was not shown a yellow card. Egypt said on Twitter that team doctor Mohammed Abulela was in contact with Liverpool's medical team and had been told Salah sprained his shoulder ligaments — but Liverpool hasn't confirmed that. The Egypt team is optimistic he can return for the World Cup. Liverpool coach Juergen Klopp said "anything is possible" but that Salah is doubtful for the World Cup. The final had been hyped as a duel between Salah and Madrid's Cristiano Ronaldo. In the event, neither scored and Ronaldo patted Salah on the head as the Egyptian walked off the field. Salah scored 10 goals in the Champions League this season, but the closest he went in the final was a blocked shot before his early exit. He also had a corner which Virgil van Dijk headed wide. Salah didn't join his Liverpool teammates collecting their runners-up medals. Egypt will face Uruguay in their opening Group A game on June 15 before facing host nation Russia and Saudi Arabia. They also have pre-tournament friendlies against Colombia on June 1 and Belgium five days later. The tackle which ended Salah's final provoked fury in Egypt, where Salah is a national hero. "Ramos is a dog," was one trending topic on Twitter there, along with other insults. Egyptians took to social media to vent their frustration over Salah's injury and blame Ramos for causing it, using Arabic's rich and colorful range of expletives. At cafes in Cairo where tens of thousands watched the game, an eerie silence fell when Salah hit the ground with Ramos. They let out a collective sigh of relief when he returned to the game, but screamed insults at Ramos when he left the game for good. At one cafe in Cairo, many of the 500 people who gathered to watch the game on a giant screen left when Salah exited the match. "Ramos does not play football, it's more like wrestling. Liverpool would have won if Salah continued to play," said Mustafa Mohammed, an 18-year-old university student who wept when the Egyptian winger left the game.